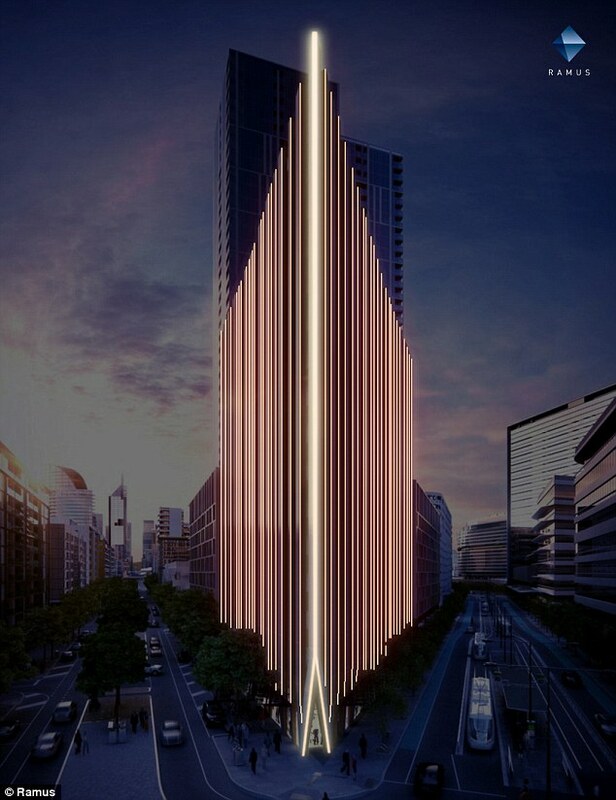 A group of Avant-garde light designers in Melbourne are about to take an apartment tower and transform it into a beautiful canvas that can tell you more about the weather than looking up at the sky. 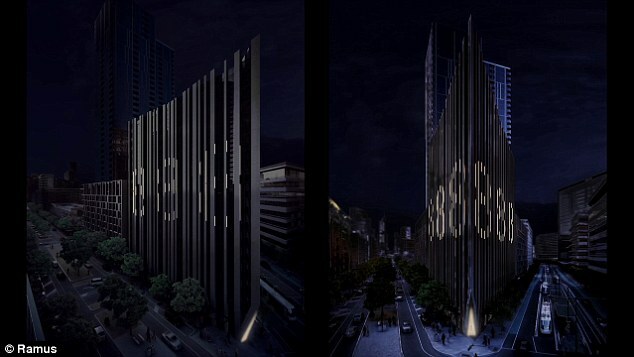 Thirty-five ‘fins’ run up and down the 40-story structure that hold 250,000 diffused LED’s. 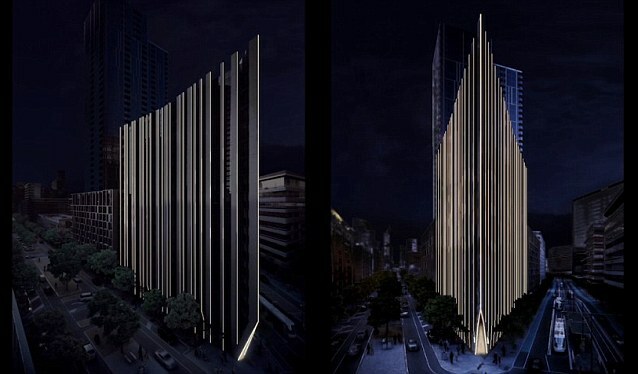 Bruce Ramus, creative director of the project, said every half hour the building will communicate the next day’s weather forecast, while during the remaining time it will be like a ‘light house’ communicating the ‘feel’ of the weather through light. ‘Essentially, if the weather changes, so will the lights,’ he told Daily Mail Australia. After spending eight years living in Melbourne Mr Ramus said he noticed Melburnians had a peculiar obsession with the weather and thought it could be possible to ‘bring light to a community’ in a way that articulates what it actually feels like to be there. 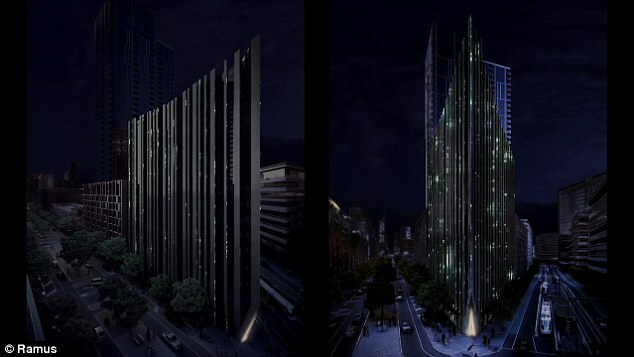 During the day it will appear to be a normal building but as the sun goes down and the city is plunged into darkness, you will really see the effects of the lights. ‘There’s a lot of movement available to this lighting system so if it ever gets windy down in the Docklands, the lights will move directionally with the wind. ‘The movement isnt physical but the way we can program the lights means there will be a sense of gentle but apparent movement,’ he said. He explained that by experimenting with the lights programming he can take a cool blue and introduce a shadow that can make it appear as if the building is moving, as rain would. The light show will be based off weather data sent through by the Bureau of Meteorology. Don’t expect the building to look like the weather forecast app on your phone though as Mr Ramus wants the building to echo more than the temperature. ‘We really want to explore how a cool change feels, or the breaking sun feels,’ he added. Mr Ramus said light is a language everyone can understand because we don’t understand it through our brains, but instead feel and understand it through our bodies. ‘When you see a blue light, you might not be able to describe it but you get how it feels. Light is a language we don’t have to think about,’ he added. Mr Ramus said he wanted to bring a feeling of movement that’s engaging so buildings can start to relate to people and reflect humanity. ‘You get it out there in nature all the time. There are subtle movements in trees or the ocean. 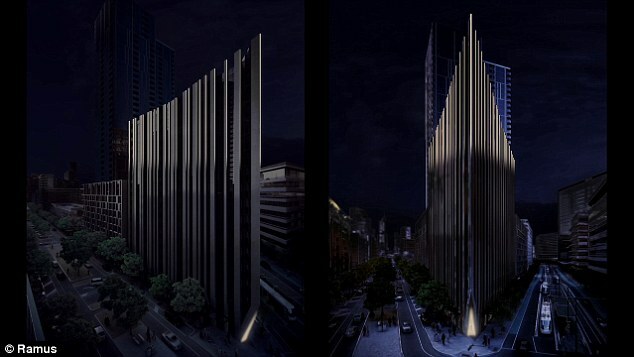 The Lend Lease building is expected to be completed in early 2017 however Mr Ramus said, if all goes to plan, the lights should be up and running next year.